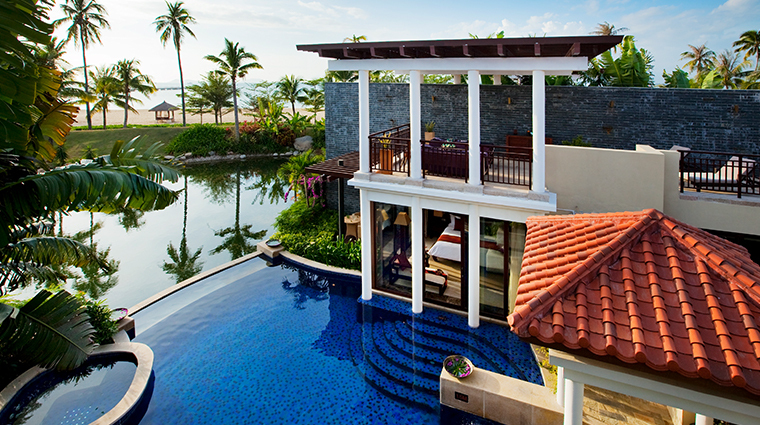 Discover exclusive luxury at Banyan Tree Sanya, a Hainan Province retreat where private beaches and clear blue waters are always in season. 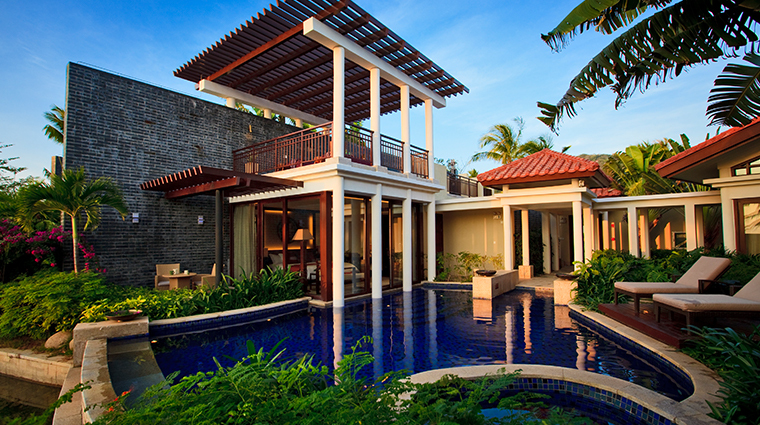 Boasting 49 private pool villas tucked among a lush tropical garden, this resort transports you to tranquility far away from the tourists who crowd some of Sanya’s other scenic stretches of sand. Built to blend seamlessly with the stunning surrounding, the villas include natural textures and a neutral color palette that add to, rather than detract from, the views from the floor-to-ceiling windows found around the property. 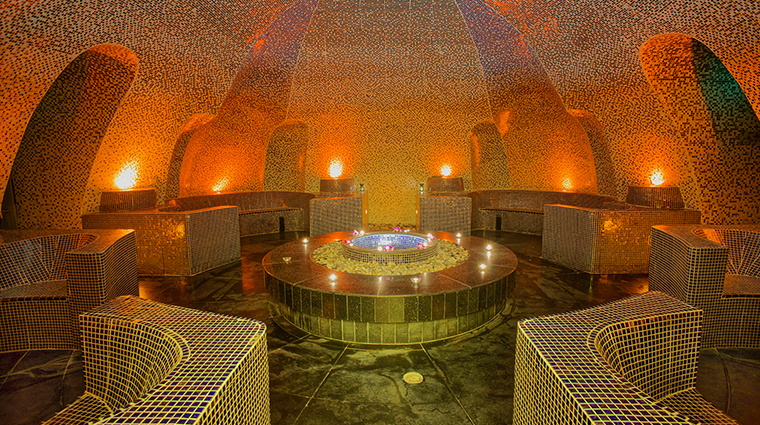 A soothing spa, two elegant dining venues and warm and friendly staff round out the secluded hotel’s elegant offerings. 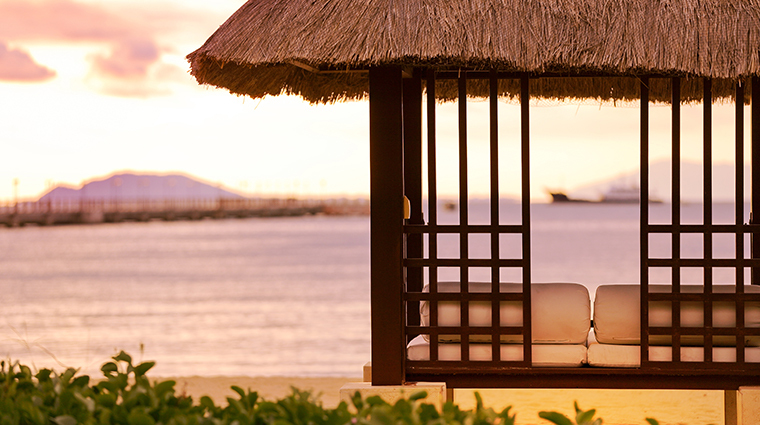 The Sanya hotel provides a retreat for couples and honeymooners, but it takes the romance a step further with unique itineraries for two and delightful destination dining options. 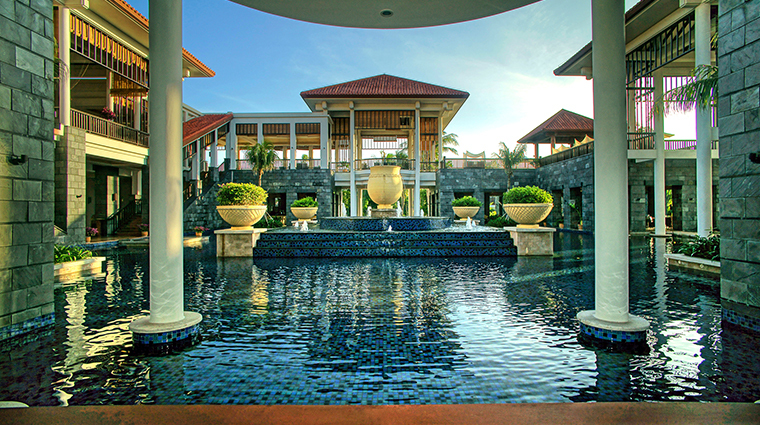 Banyan Tree supports the local community by using furniture and fabrics from local craftsmen (visit the onsite gallery to pick up some of the goods as souvenirs). 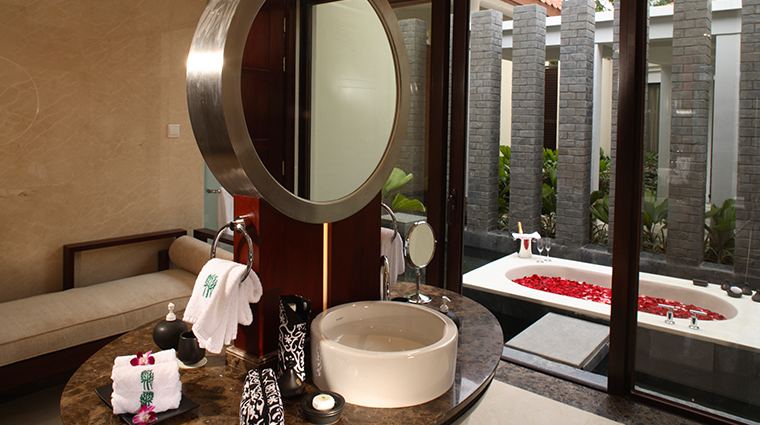 Don’t leave this Sanya stay without booking some time in its spa. 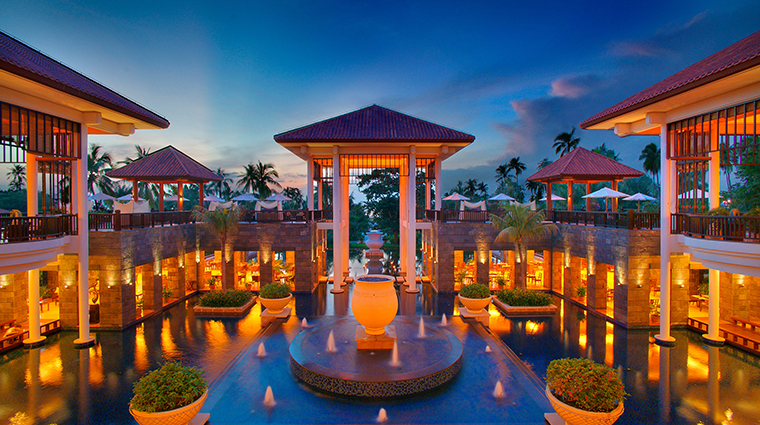 Banyan Tree therapists undergo at least 350 hours of training at the brand’s dedicated academy in Phuket, Thailand, to ensure you enjoy a relaxing treatment every time you visit. 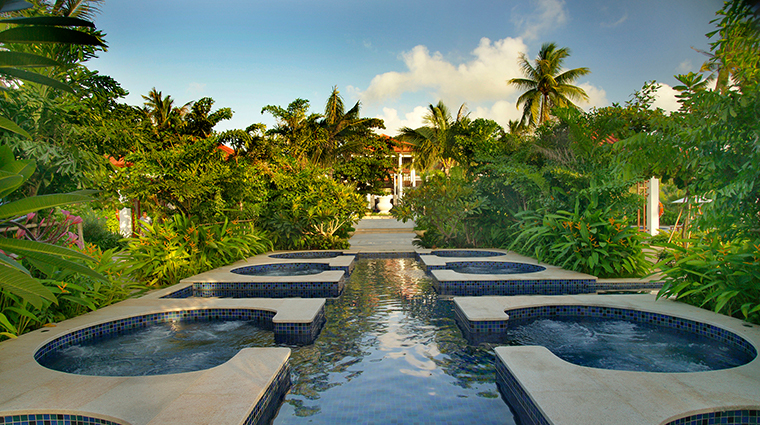 Every villa comes with its own pool, a heavenly amenity. 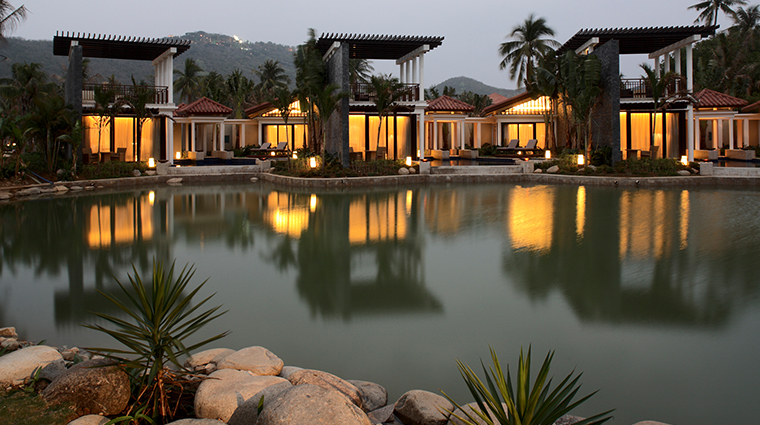 Banyan Tree Sanya is about a 45-minute taxi ride from the airport. You can take a taxi direct or ride the airport shuttle to Big Pineapple Square before hailing a cab to the luxury hotel. 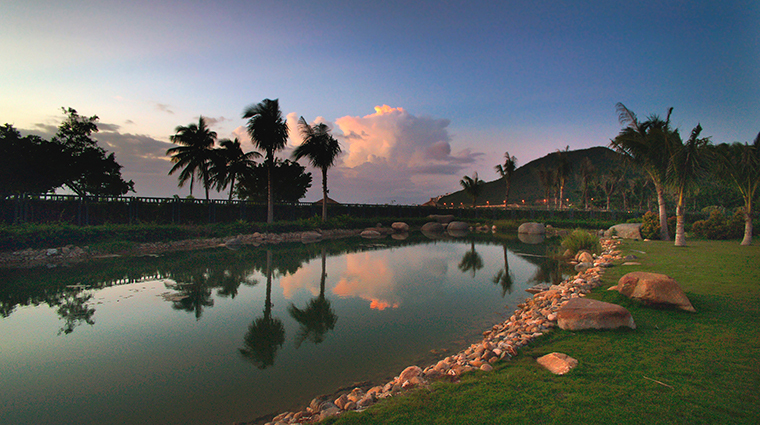 Snag a selfie in one of Sanya’s most scenic spots by making the trek up Luhuitou Mountain. 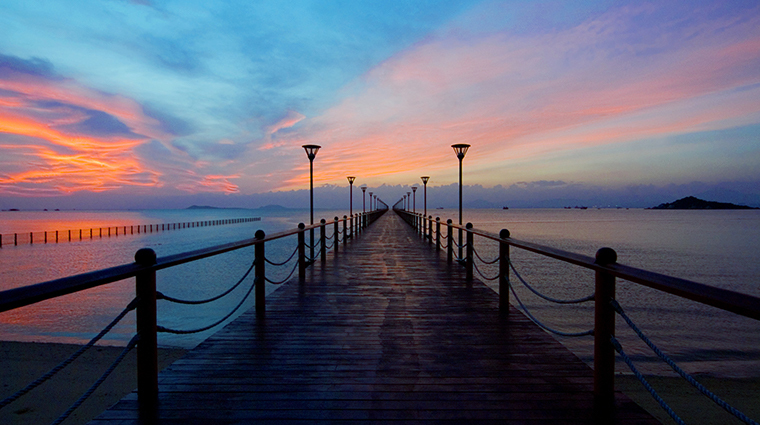 This picture-perfect perch is just a five-minute walk from the resort. 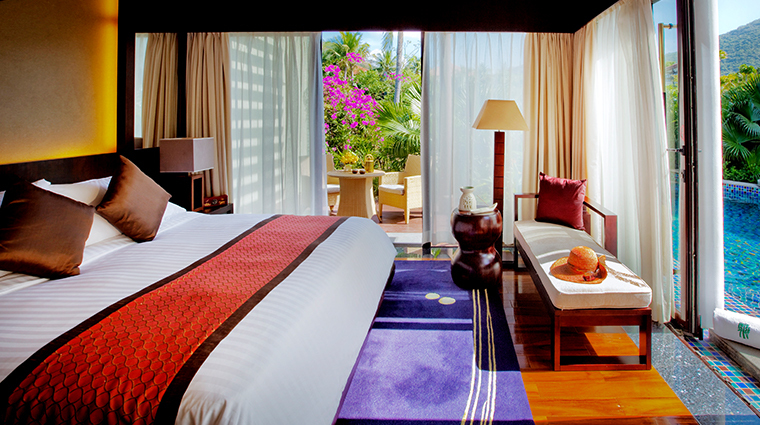 All of Banyan Tree Sanya’s villas include walk-in closets and floor-to-ceiling windows for taking in the tropical and ocean views. 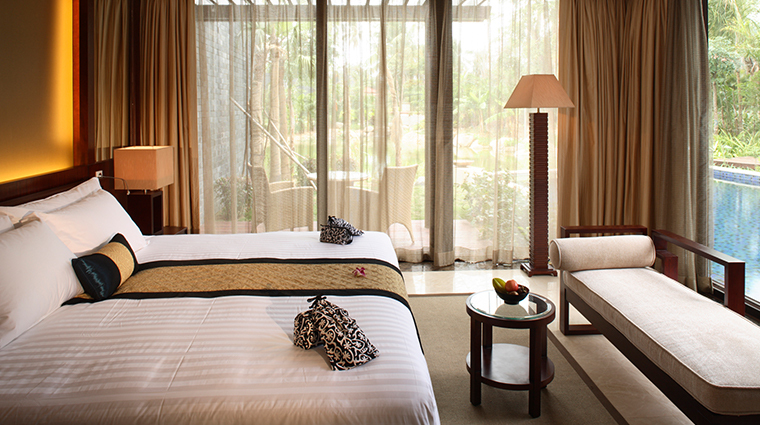 The villas’ interiors feature warm wooden furniture, neutral-colored walls and pops of red and orange to complement the lush garden surroundings. 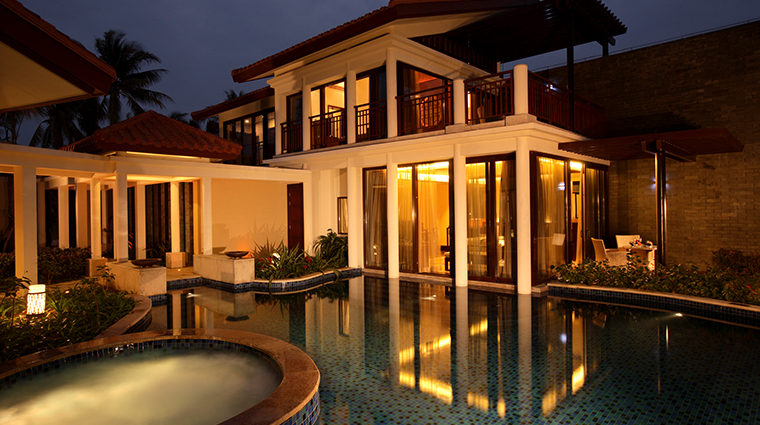 The crown jewel of this resort’s accommodations is the luxurious Luhuitou Two-Bedroom Pool Villa. This 6,178-square-foot space has two bedrooms (each with an en-suite bath), a private sun deck, a 915-square-foot pool and its own massage pavilion. 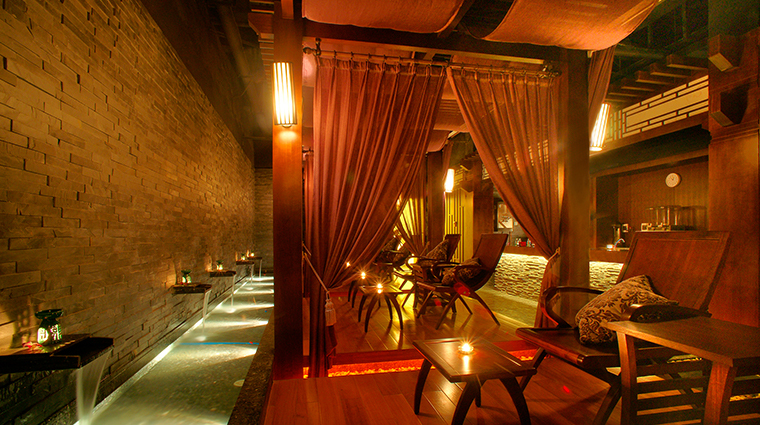 Indulge in delicious Thai fare at Coriander House, a contemporary eatery overlooking the lobby’s elegant water features. Dine on delicacies such as basa with green curry vegetables and pad Thai. 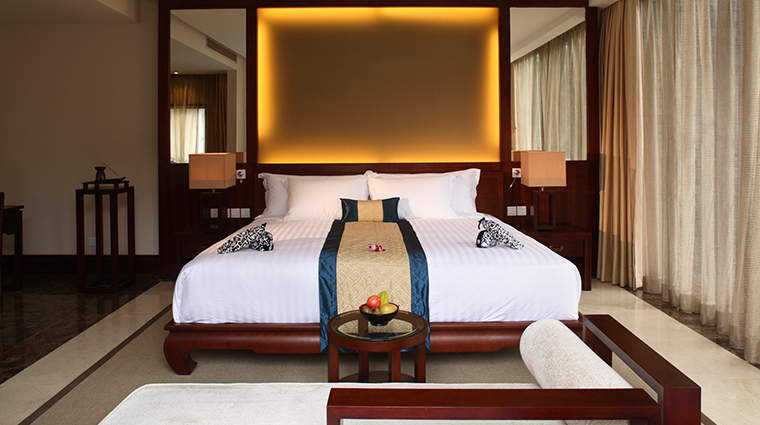 Ming Yue serves up an international breakfast buffet of Western delights and Asian specialties every morning. A choice of European or Chinese à la carte menus is available come dinnertime. Light bites and well-crafted cocktails can be enjoyed in the comfort of the resort’s beautiful lobby at Tian Ya Hai Jiao Bar.